LONDON, England -- England could play their Euro 2012 matches in front of half-empty stadiums due to extortionate hotel prices in Ukraine. England usually take one of the biggest away supports to major championships, and tickets are usually scarce - but the FA are struggling to sell their allocation for this summer's tournament that is being co-hosted with Poland. 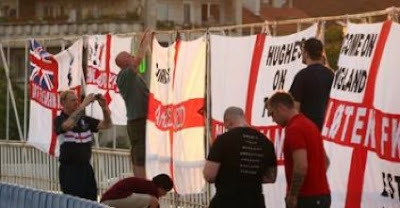 The Three Lions open up their campaign against France in Donetsk before playing Sweden in Kiev. Their final group game is back in Donetsk when they take on hosts Ukraine. According to the Daily Telegraph, a one-star hotel in Donetsk, where England face France on June 11, is asking for £1,000 ($1,578) a night, while even guesthouses 35 miles away are looking for £240 ($379) per person per night. Meanwhile, a room at the Ibis hotel in Kiev would normally cost £49 ($77), but is currently advertised for £550 ($868) when England are playing Sweden in the city on June 15. “Getting there is OK, the cost of flights is OK, ticket prices are OK, it is the cost when you’re there that is a worry," admitted David Taylor, who is chief executive of UEFA Events. "They (Ukraine) are playing with fire. It is inevitable to an extent. People want to see what they can get out of the situation, but some prices can be counterproductive and, to be honest, some of the prices are quite ridiculous." “England have not sold out their allocation yet. For some reason there do not seem to be the same numbers as there normally are." England have been allocated 7,500 tickets for the match against France and 9,000 for their clash with Sweden. “The problem is there aren’t mid-price hotels. People in Ukraine need to realise we’re in austerity times,” Taylor said. “In Lisbon, France against England in 2004 was the hottest ticket of the whole tournament. It’s the same wherever England played in the 2006 World Cup and now we’ve got them playing in Donetsk and neither France nor England have taken all their ticket allocation." “It’s in a big stadium and, it’s incredible really, but this is one of the games we are worried about in terms of having rows of empty seats." Taylor also said that UEFA are powerless to do anything about hotel prices. “All we can do is try to advise and speak to the Ukrainian government and tell them this is happening," he added. “We’ve asked them ‘do you realise what is going to happen?’ We’ve warned them the income in the country is going to be much, much less than we were forecasting." “If you want the visitors, they have got to apply some local pressure to the hotels to make them be more realistic."